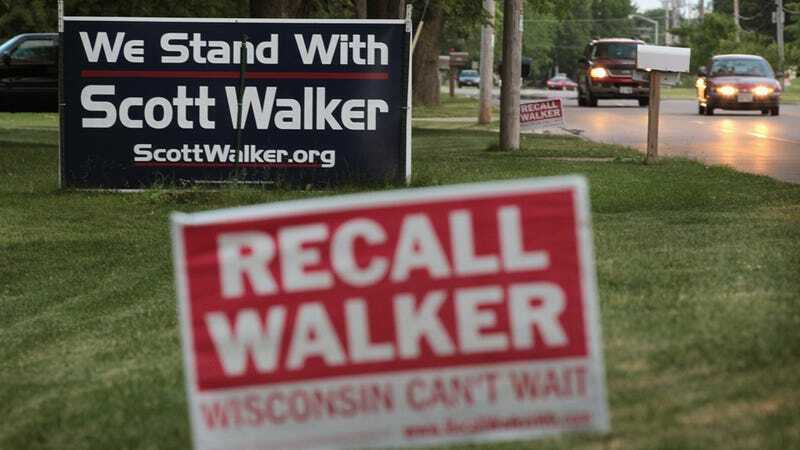 Well, today Wisconsinites turned out in massive numbers to vote in a historic recall election, and in the end it appears they chose to stay with their horror show of a governor, Scott Walker. This comes as a serious blow to Wisconsin's proud progressive tradition, even though it was a somewhat expected result. Walker was a slight favorite going in, but after a likely record breaking turnout many hoped it would swing in favor of Walker's opponent, Tom Barrett. Not so. Walker's victory owes a great deal to the fact that he had a huge cash advantage over Barrett—he outspent him seven to one. Much of his money came from wealthy donors like the Koch brothers, many of whom were out-of-state. He was elected in 2010 and has since presided over a total Tea Party circus of awful legislation—including, most memorably, his gutting of the collective bargaining rights of unions which caused massive protests to erupt in Madison in early 2011. He's also pursued a number of anti-woman policies, including the defunding of Planned Parenthood and the repeal of an equal pay law. It's disappointing, to say the least, that the people of Wisconsin opted to keep such a divisive and completely backwards governor in office. Let's just hope that he doesn't go on an extra horrible rampage now that he's gotten a bit of a show of public support. In any case, the Scott Walker drama will probably not go away completely. He has been mentioned as a possible vice presidential candidate for Mitt Romney, which would obviously be a serious case of two wrongs not making a right. There is also a cloud hanging over Walker's head because of a criminal investigation being done that involves a number of his former high-ranking staffers from when he was Milwaukee County Executive. There is some speculation that he is the ultimate target of the investigation, so that could potentially blow up in his annoyingly smug face. Golly gee whiz, we might just have another Sarah Palin on our hands here! But before we face that fresh hell, let us remember that as disappointing as this outcome is to the many progressive people in Wisconsin, they ought to be proud of the inspiring fight they put up against him and his band of merry bazillionaire backers.